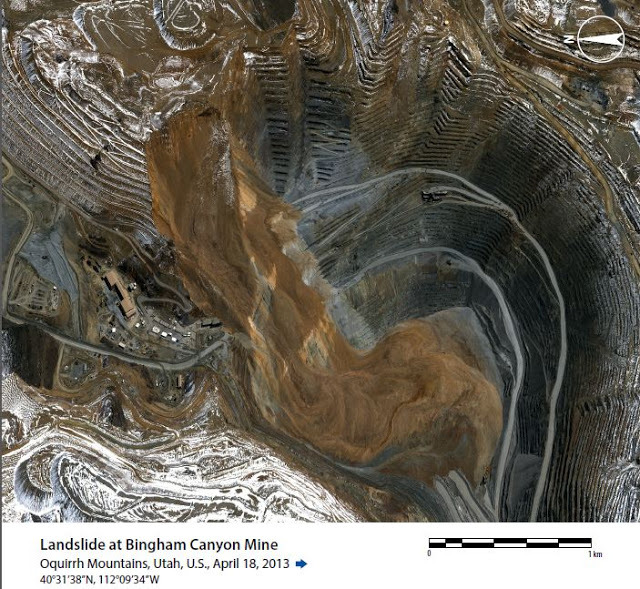 High-resolution satellite image taken April 18, 2013, showing landslide in Bingham Canyon mine near Salt Lake City, Utah. 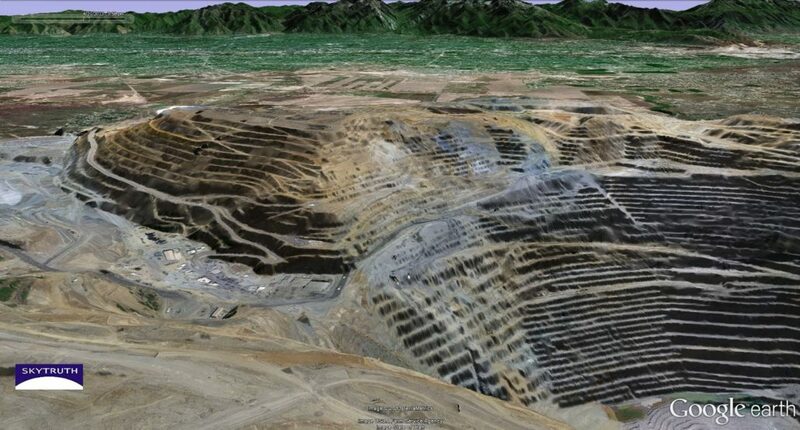 Source: WorldView Report from DigitalGlobe. This issue of WorldView also has an image of the fertilizer facility — and surrounding neighborhood — near Waco, Texas that was leveled in a deadly explosion, caught here on a cell-phone video. Watch this in full-screen mode to get a feel for how catastrophic this was — and maybe a new appreciation for the lifesaving value of good zoning laws. 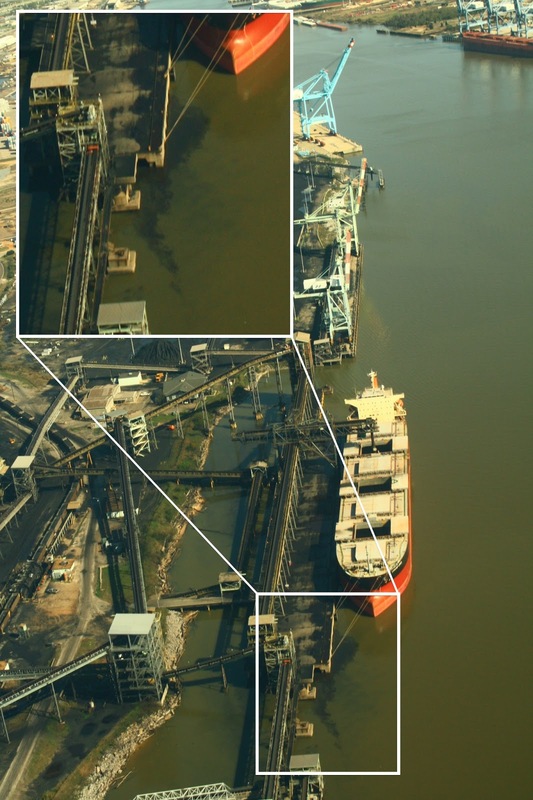 On March 24 staff from Gulf Monitoring Consortium members SkyTruth, SouthWings, and Gulf Restoration Network flew over the Alabama and Mississippi coastline investigating pollution and degradation related to energy development. Our flight originated from Mobile, arranged by SouthWings with local volunteer pilot Dr. David Mauritson generously donating his time, talents, and fuel to our monitoring efforts.First, we flew over the Port of Mobile which dominated the landscape immediately after takeoff from the Brookley Aeroplex. 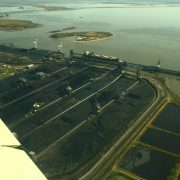 The port boasts the McDuffie Coal Terminal, one of the nation’s largest coal import-export terminals. In addition to several smaller facilities nearby, McDuffie can handle a staggering 30 million tons of coal in a year, but in the past year they processed *just* 13.9 million tons – only 46% of capacity. These numbers are of interest because of the intensifying debate over coal export. 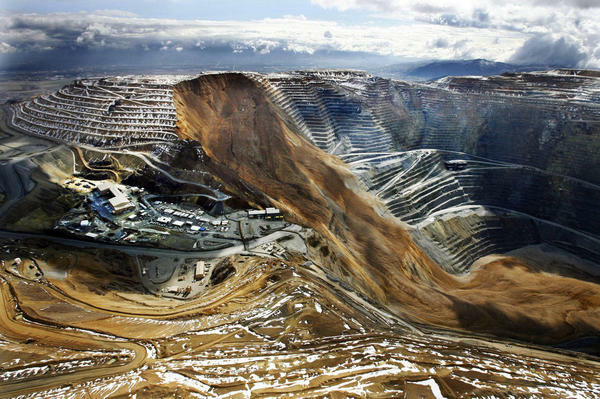 With cheap natural gas flooding the market from fracking plays like the Marcellus Shale, there is growing pressure to sell American coal overseas to foreign markets – particularly Asia and Europe. 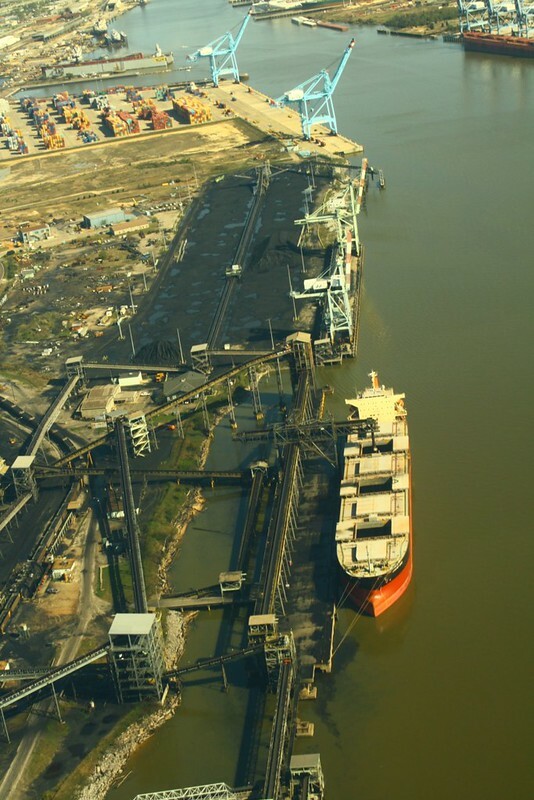 Only one vessel was loading coal at the time of our flight, the Panama-flagged Grand Diva. 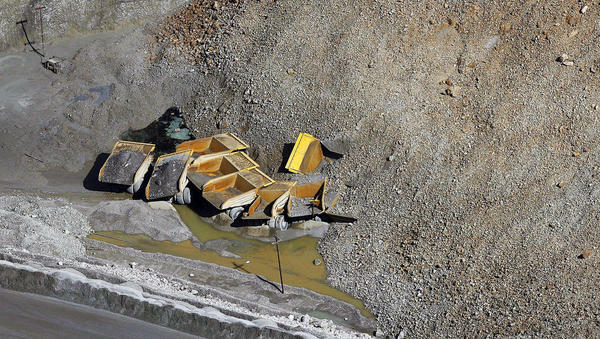 This operation was depositing a black plume of coal dust in the water. 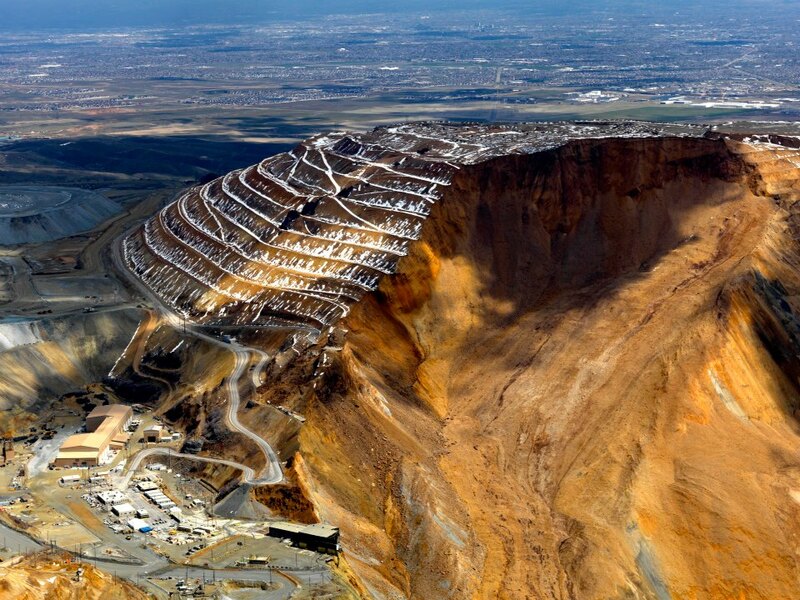 As an individual case, this may not result in a significant impact on the environment. 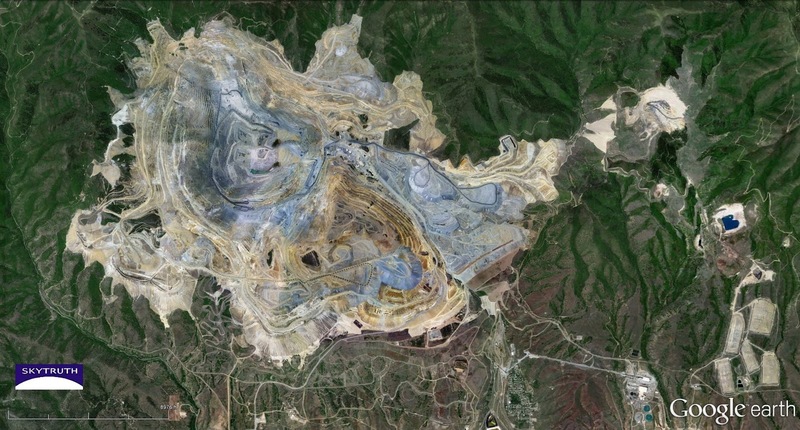 But a brief review of Google Earth’s historical imagery yields two previous events clearly showing coal in the water, and several other less-clear images that appear to show pollution, suggesting this is a common event that may result in significant cumulative impact. Air pollution is another consideration. 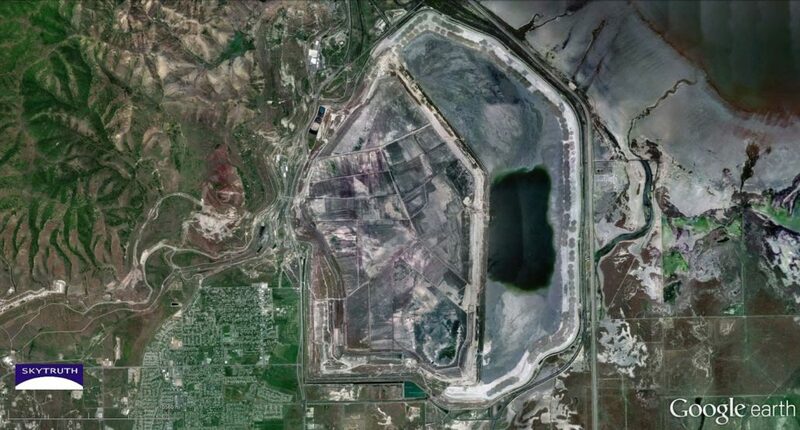 Chronic coal-dust blowing off the stockpiles at a coal terminal are the basis of a Clean Water Act lawsuit in Seward, Alaska, and one of the main arguments throughout the Pacific Northwest against expanding coal export terminals to move more Powder River Basin coal from Wyoming to Asian markets. This is only one step along the way from mine to market – coal trains derail far more often than you might think (in North Dakota, Michigan, and Nebraska, just this past month), loaded barges crash into bridges (just this week), terminals flood when severe storms come through, and ships even crash into the loading docks. 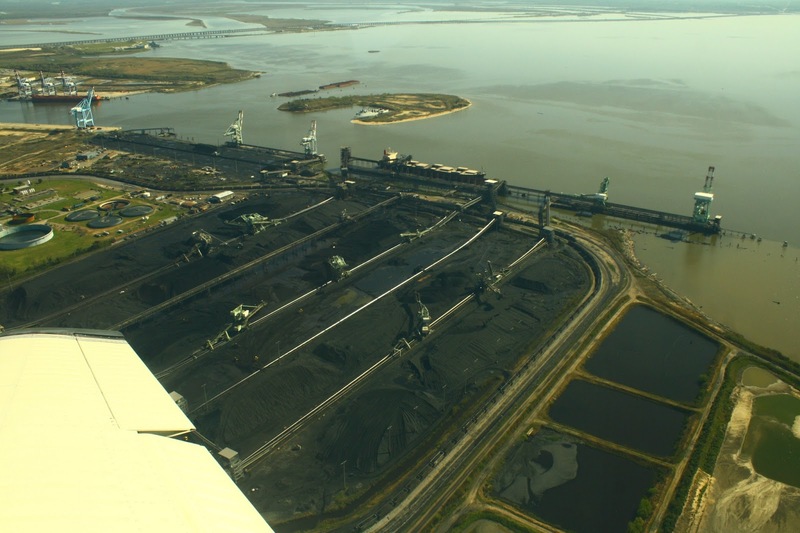 Not counting carbon emissions from burning the coal, scientists, environmentalists, and concerned citizens along coal transport routes are worried that these cumulative impacts will harm public health, disrupt their daily lives, and negatively impact the ecological health of waterways along the path from mine to port. Bulk transport by barge is cheaper and more fuel efficient than even freight rail, but extreme weather events exaggerated by climate change threaten its reliability. 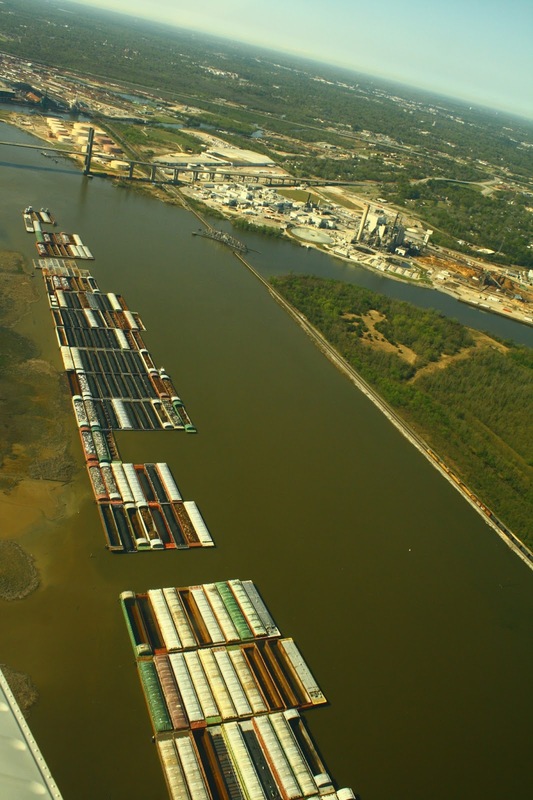 Last year’s drought crippled transport on the Mississippi River at the end of 2012, and without significant rain river operators could face another low water crisis in 2013. More to come including a leaky settling pond, an oil slick off Gulfport, and severe erosion resulting from ill-conceived oil spill response practices on Dauphin Island. Be sure to check out the photos of the whole flight on Flickr. 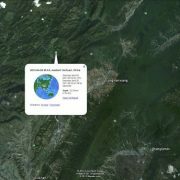 An earthquake of magnitude 6.6 struck near the city of Longmenxiang, in the western portion of China’s Sichuan province. It did considerable damage, killing nearly 200 people and injuring more than 11,000. 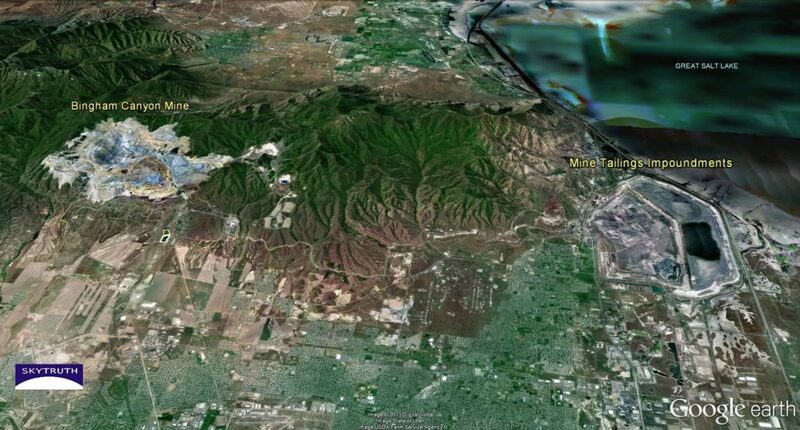 This area is very active seismically. In 2008, a much more powerful quake struck about 90 miles to the northeast, killing nearly 70,000 people, including many children who were crushed when poorly built schools collapsed. SkyTruth Alerts screen-capture showing the locations of foreshocks and aftershocks of greater than 5.0 magnitude around the magnitude 6.6 quake that struck in western Sichuan Province, China, on April 20, 2013. You may know that through our SkyTruth Alerts system we publish regularly refreshed data on oil and gas drilling activity, fracking chemical disclosures, and oil and hazardous materials spills and other pollution incidents reported here in the US. But we also publish notifications from the US Geological Survey for any earthquake in the world large than magnitude 5.0. Here’s what our Alerts map looks like for the area around the April 20 temblor. Six separate quakes over 5.0 magnitude occurred in the immediate vicinity of the main 6.6 quake. Two occurred slightly before the main shock; the other four are aftershocks. 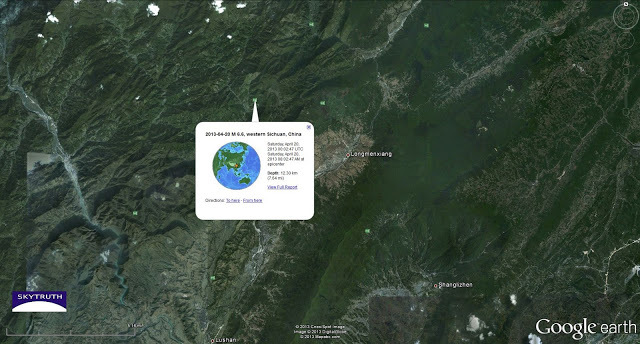 Look for the small green squares on the image above, or go to SkyTruth Alerts, type “Longmenxiang, China” into the search bar, and see for yourself. 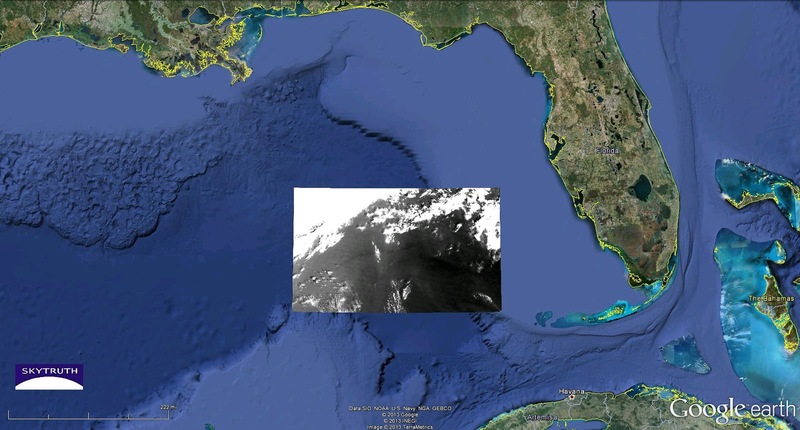 95-Mile-Long Slick in the Gulf of Mexico? SUSPECTED SLICK IS SEEN AS LONG NARROW PLUME APPROXIMATELY 95 MILES LONG AND 1 MILE OR LESS WIDE. NOAA’s analysts now think it’s probably not oil; more likely it’s natural surfactant caught in the convergence zone between two water masses. I agree; this is close to the edge of a loop current now in the northeastern part of the Gulf. And bilge-dump slicks usually look a lot sharper than this (see a slideshow of our examples from radar imagery). 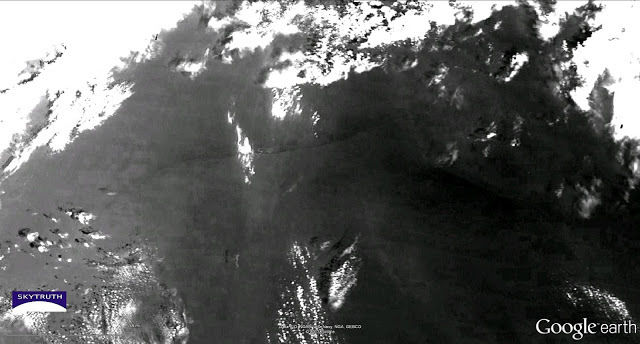 Here’s detail from a MODIS/Terra satellite image taken at 16:50 UTC on April 14, 2013, showing the apparent slick. 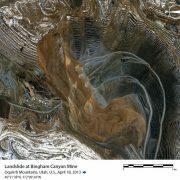 Location map showing detail from MODIS/Terra satellite image taken on April 14, 2013. Detail from MODIS/Terra satellite image of slick (dark, east-west trending streak) probably caused by natural surfactants accumulating along the convergence zone between ocean currents. 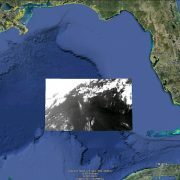 https://skytruth.org/wp-content/uploads/2013/04/SkyTruth-possible-bilge-dump-14april2013-overview.jpg 344 640 John Amos /wp-content/uploads/2016/08/test_logo.png John Amos2013-04-16 21:47:002019-02-15 11:48:5495-Mile-Long Slick in the Gulf of Mexico?